These floating diamonds are absolutely breathtaking. The texture of this sphere is definitely unique. You'll want to wear this for every occasion. A floating diamond necklace with a cool and edgy twist. This square diamond necklace can be worn at two different lengths. The marquis cut of this stone is so unexpected. This pendant is covered with pave diamonds for that extra sparkle. We love the design of the marquis diamonds here. 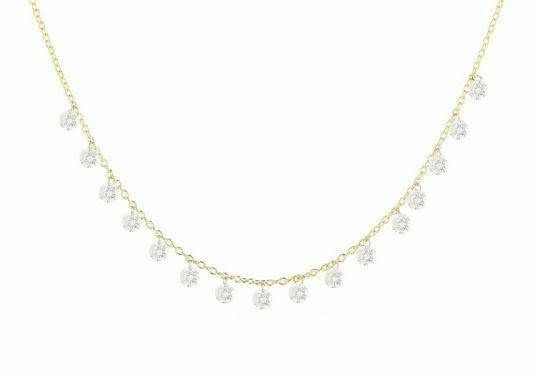 This necklace features a center stone with a halo of diamonds surrounding it. Trust us, you will never stop wearing this necklace. We can't get over this off-center look. A unique graphic take on the trend. Dainty necklaces will always be in style. The rose cut makes this diamond look as clear as crystal. This will give any ensemble a touch of elegance. You will never go wrong with this bezel diamond necklace. The diamond shape gives the stone a unique feel. Layer this with your other favorite necklaces. This diamond sphere is perfectly dainty and cool. Made with lab-grown diamonds, this necklace is perfect for both formal and casual occasions. The way this diamond simply sits on the chain is so delicate. And now, the foolproof way to clean your diamond earrings like a pro.